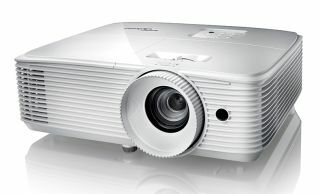 Optoma unveils new, affordable Full HD projector | What Hi-Fi? We've recently lauded the company for its 4K prowess, but Optoma isn't neglecting the entry level. There are some very agreeable 4K TVs around for less than £600 but, at best, they're reasonably sized and no more. But if you want the biggest image possible for your money, then a projector is the way forward. And Optoma is widening your choice with the announcement of the new HD27e. The HD27e replaces Optoma's HD27, and the company claims the new machine delivers brighter images, quieter running and longer lamp-life (up to 12,000 hours) than the outgoing model. £600 (or perhaps a little less) buys a Full HD 1080p resolution, a maximum image size of 301in, native 16:9 aspect ratio, a stated contrast ratio of 25,000:1 and 3D compatibility. Inputs are a pair of HDMI 1.4a sockets (one of which is MHL ready for your smartphone or tablet), and outputs include a 3.5mm audio out, 12V trigger and a USB-A power out to make connecting a Chromecast dongle (or similar) straightforward. The HD27e, which weighs a little under 3kg, also features a single speaker driven by 10 watts of power. It's on sale from today.